Give me some ointment! I need an appointment!! Coz from one of the coolest labels (Mint Records) from out of one of the very coolest countries ever (O Canada!) comes this 23-song, 72-minute sampler guaranteed to make you ask yourself, at least a dozen or so times, "Hey! How come I haven't got THIS band's stuff yet?" (as only the best of samplers ever really should). 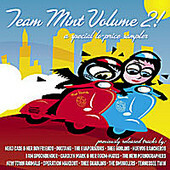 Sure, you're surely already familiar with Mint's biggest alt.star Neko Case (fully represented herein in various spots and in various musical incarnations), but then again there's the ever-modulating pop-punk of New Town Animals, The Smugglers (who so VERY easily out-Buddy Holly Weezer), and not one, not Two, but THREE -- count 'em! -- appearances by none other than Nardwuar The Human Serviette, the Great Wide North's very own Andy Kaufman-meets-Howard Stern. But somehow the whole show's practically stolen in five minutes flat by the stellar alternative to alt.C&W sounds of the Tennessee Twin's "These Thoughts Are Occupied": Roll over again, Patsy, and someone tell Loretta (not to mention k.d. lang) the news! Then take it all directly on home with the audacious ambiance of I Am Spoonbender and you've just heard one of the most courageously concocted collections ever to deserve a permanent spot on your Random Play drive.